Another excruciating back-and-forth battle ended the final point of the 2015 USAU Women’s College Nationals; swirly, sweeping winds manipulating discs with varying ferocity at pivotal moments. External forces weighed heavy on the shoulders of the players on the field that day, but one team managed to rise above and take home the gold. It was a crafty high-release backhand from Callahan Award finalist Bethany Kaylor that earned Oregon Fugue their third national championship in six seasons. For some on the roster, 2015 was the first time going home with a title to their name; for others, their second. For coach Lou Burruss, the windy win would mark a fourth championship, a feat reached only by former Stanford Superfly’s Robin Knowler Davis nearly ten years ago. With a firm foothold established in the “best dynasty ever” conversation, Fugue would bring back nearly the entire team, headlined by the remarkable core group of Kaylor, Jesse Shofner, Alex Ode, and Olivia Bartruff, all competing for a fifth year. Their depth remained, growing the talent pool with proven freshman and transferring players, all coming together to create a spectacular 2016 roster, who have a chance to repeat as champions for the first time in the women’s college game since Davis’ 2005/06/07 Superfly team(s). This year’s circus, however, finds itself without it’s ringleader. All of the traits and habits and ideas that this Oregon team has been known for over the last seven or so years have primarily been the brainchild of coach Lou. A team constructed by certain philosophies of disc possession and inclusive, open team culture now finds itself without the brilliant mind that crafted them. Lou isn’t just smart; he’s odd. His sideline attire draws attention, his dialogue blunt and simple. His game plans are surprisingly basic, using strategies that you can find at almost any other competitive college team. But simplicity, bluntness, and freedom are the building blocks of this franchise. Burruss is an advocate of particular coaching methods and attitudes, especially those of The Inner Game: competing parts of the mind that affect the way players think and act on the field. The results speak for themselves: a Fugue squad that plays fast, takes chances, and wins. 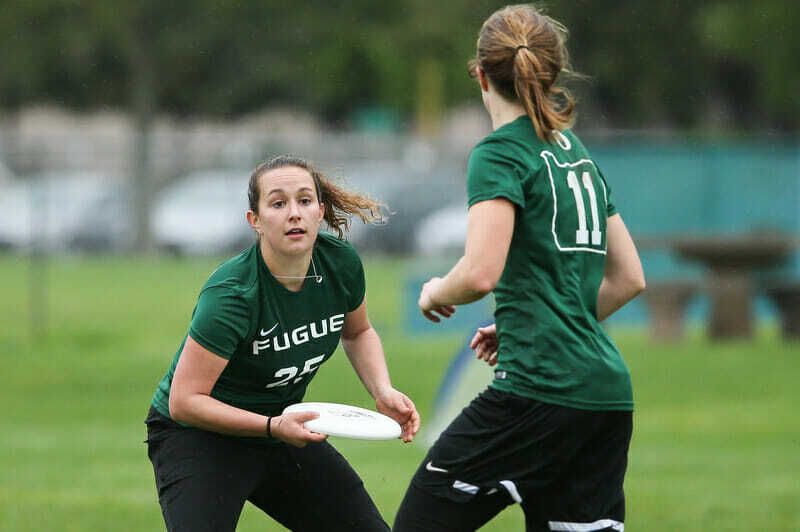 With his departure, Fugue has looked to continue the same system of play style and lifestyle, as the team returns many long-time players and finds a handful of “new” head coaches in Katheryn “Nij” Weatherhead and Claire Sharman, assisted by Danielle Hirsch and Angela Tocchi, who all played with Oregon under Lou Burruss. The “Clown Tent” would continue the show without the ringleader, hoping that the show would go on without a hitch. Oregon has been a regular season juggernaut for many years. The team won both the Stanford Invite and the President’s Day Invite in each of the three previous seasons and hadn’t lost more than two regular season games since 2012. With the type of roster Fugue has in 2016, the team seemed only more likely to win out again, despite an improving women’s college scene. The team compiled a 25-4 record through this year’s regular season, yet despite the impressive winning percentage, Oregon won only a single tournament. Losing twice to Whitman and once to UCLA in finals and semifinals of their first three tournaments, Fugue had been defeated by just four points combined in those three games before suffering an odd 8-15 finale in the third place game at the Stanford Invite against British Columbia, their worst loss since 2009. The uneasy results may have caused some to believe that the absence of Lou Burruss signaled that Fugue had not only lost a coach but also their swagger. Oregon laid those rumors to rest with a dominant performance at Northwest Challenge in late March to re-establish their primacy in the women’s college landscape. Beating up on lesser local schools in January is how Fugue started their season. A 67-6 point differential led them to their only real challenge of the tournament: the Whitman Lady Sweets in the finals. Fugue fell behind a break early and never caught up. Whitman seemed to bring more energy and a cleaner game, allowing just three breaks to a Fugue team that has usually found a way to ramp up and generate consecutive breaks to challenge teams for wins late in tournaments. Missing on the weekend was Bethany Kaylor, arguably Fugue’s most important player. Kaylor generally draws the toughest matchup on defense and is easily a top-3 offensive talent. While Whitman’s talent distribution and roster composition don’t lend a typical A+ player for Kaylor to try and lock-down, her presence obviously hampers the elite-level depth of the team. Without one of their leaders, Fugue fell to Whitman 14-12. Three days of quality opponents awaited Oregon in California two weeks after the upset loss in Corvallis. A close game against California started an undefeated Saturday, and a similar game ended an undefeated Sunday against Western Washington Chaos. Fugue would play UCLA BLU on championship Monday, who were fresh off a Santa Barbra Invite tournament win against 2015 Nationals finalists Stanford. The game — available in UltiWorld’s College video package — was one of the best this season. UCLA has never looked better, matching Oregon blow-for-blow before holding off the defending champions in a 15-14 win. Fugue would finish off Texas to take third place, but they found themselves again traveling home without a tournament title under their belts. Arguably the biggest regular season tournament painted various pictures of the 2016 Oregon team: a universe point win against top-ranked UBC showed Fugue was still elite; a single-point victory over Texas Melee that concluded with consecutive breaks against Oregon just before the final horn sounded showed a team that maybe lets off the gas pedal; a massive four consecutive breaks against Ohio State to come from behind and win showed the knockout potential; wins against an uninspired UCLA team and unranked Carleton showed admittedly not much. The semifinal matchup allowed Fugue a shot at payback against the Lady Sweets of Whitman. Oregon jumped out to an early 6-3 lead, taking half 8-7. The teams would trade breaks and points before lining up for universe point, which found Whitman edging out a win. This time around, it was shot-taker and primary handler Hayley Wahlroos that was missing for Fugue. The game really couldn’t have been closer: the first half saw a couple streaks of two or three points, but the second was back and forth action ’til the end. The final point of the game, a huck from Nina Finley to Marlena Sloss, fluttered off the fingertips of Alex Ode in coverage, missing the block by millimeters, by milliseconds. Fugue was running a universe line — seven of their best players — while Whitman ran their standard offense. If Ode managed to get the block, who knows what could have happened. And then, to close out the tournament, British Columbia handed Oregon their worst loss in a sanctioned tournament since 2009. Fugue has never been the team to quit on themselves at the end of a tournament, regardless of whether they made the finals or not. This is a team that grinds to the end of every competition. The two previous games against UBC — one in the unsanctioned Bellingham Invite in January — yielded one-point and two-point differentials. It was impossible to see this result coming after being 5-0 just hours previous. The final result at Stanford Invite likely has implications on the mind-set and mental state of the team at the time, but exactly what it says is left to conjecture: a gassed, defeated team limping out the door; a team reeling from a universe point loss in the round previous; an uninterested team coasting through a final game before heading home. Maybe some of these are true, maybe none of them. Fugue didn’t find much solace in a two week break before heading to the regular season finale. The 2016 Northwest Challenge pits the deep Northwest region teams against one another while sprinkling in some high-class talent from other regions — Pittsburgh’s Danger and Dartmouth’s Princess Layout — in a tournament formatted to help teams prepare for the longer games of College Nationals. Despite the time off, Hayley Wahlroos was still unable to play, and Alex Ode was sidelined with a concussion, possibly occurring after an odd pivoting collision with UCLA BLU star Kristen Pojunis at the Stanford Invite. Seven other players would miss a game or a day or the weekend. On top of the limited roster, one of the team’s vans was stolen while on the trip to Burlington. At this point in the season, Oregon had seemed to struggle to overcome adversity on the field in many close losses with less pressure and more healthy bodies. That weekend in Washington, in the face of seemingly more adversity than than the other tournaments combined, Fugue would dominate the field in route to an undefeated weekend for the tournament title. Reaching a little further into their roster, Fugue would still find their stars filling the stat sheet, but other players stepped up to allow the battered and bruised lineup to work efficiently. Foley Galvin was a staple in the final game against British Columbia, Oregon’s most contested game of the weekend, after missing the previous two days. Lillian Weaver and Kaitlyn Brunik, commonly found on specific lines in normal circumstances, logged a huge amount of points, playing both ways, to fill gaps from various injuries. Jesse Shofner may have had the highlight play of the weekend, and the seemingly unstoppable Olivia Bartuff may have scored many more points than anyone else, but it was role players that enabled the team to have such success. And here they now stand, a high-ranked team heading into the postseason with many quality wins that we can’t really peg as a championship favorite or a bubble team. The team has looked completely beatable at times, relatively unstoppable at others. Wahlroos and Ode are on track to return to the field for Nationals, but does their return alter the team’s play after winning their only tournament of the season without them? Can all the players, especially Maggie Kennedy — a big-name transfer that has shown flashes of brilliance that has been battling a lower body injury all season — stay on the field? We do know a couple things for certain: the roster is stacked, the players are experienced, and the team has avenged each big loss this season and has recently shown resilience in the face of adversity. This is not the same team that the nation has come to know over the past six seasons. In the large, looming shadow of Lou, Oregon Fugue are attempting to make a new name for themselves by doing exactly what the world expects: winning. Comments on "The Old And The New: Oregon Fugue Return Their Stars, Lose Their Coach"